On Saturday April 14th, 2018, 107 Italian wine producers gathered in Verona for “OperaWine, Finest Italian Wines: 100 Great Producers” to celebrate the quality and diversity of Italian wine along with its enduring bond with the United States, the largest market for Italian wines. 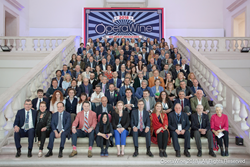 Organised by Veronafiere and Vinitaly International in partnership with Wine Spectator, since 2012 OperaWine has been the opening act of Vinitaly as well as a showcase of the finest Italian wineries selected by the prestigious American publication. Founded in 1976 in San Diego, Wine Spectator is the most read wine magazine in the world. With wine always at the center of attention, the publication has also grown to become a lifestyle guide for wine lovers. At the heart of the magazine are its critical reviews. Today, Wine Spectator reviews nearly 20,000 wines each year, all in blind tastings. Through these blind ratings the magazine selects the wineries that participate to OperaWine. The selection process has two goals: first, to testify to the extraordinary quality of Italian wines; second, to showcase the breadth of Italy’s wine regions, grapes, and styles. The editors’ main criteria are wine quality, regional leadership, and historical significance. This year, OperaWine welcomed more than 2,000 guests from all over the world that enjoyed an afternoon of tasting in Verona’s historic Palazzo Gran Guardia. The tasting included producers representing all 20 Italian regions, bringing more than 60 Italian native grape varieties together in one single room. Along with several regulars, 13 new wineries made it through the selection for the first time. As Senior Editor Bruce Sanderson explained, “since the first edition of OperaWine in 2012, 170 different producers and wines have been selected.” The changing selection of producers demonstrates Wine Spectator’s commitment to keep the event fresh and reflects the vitality of the Italian wine industry. An exclusive event dedicated to foreign press and professionals, OperaWine’s 2018 theme celebrated Italian wine’s strongest ally on the international markets, the United States. In addition to OperaWine’s American partner Wine Spectator, one of the special guests to the event was the Senior Director of Winemaking at E. & J. Gallo Winery, Gina Gallo, who spoke during the Press Conference and whose wines were served during OperaWine’s light lunch. The grand Vinitaly 2019 will be held from April 7th to the 10th. Every year, Vinitaly counts more than 4,000 exhibitors on a 100,000+ square meter area and 130,000 visitors from over 140 different countries with more than 30,000 top international buyers. The premier event to Vinitaly, OperaWine (https://www.vinitalyinternational.com/?page_id=646) “Finest Italian Wines: 100 Great Producers,” which will be held on the 6th of April, one day prior to Vinitaly will unite international wine professionals in the heart of Verona, offering them the unique opportunity to discover and taste the wines of the 100 Best Italian Producers, as selected by Wine Spectator. Since 1998 Vinitaly International travels to several countries such as Russia, China, USA and Hong Kong thanks to its strategic arm abroad, Vinitaly International. In February 2014 Vinitaly International launched an educational project, the Vinitaly International Academy (VIA) with the aim of divulging and broadcasting the excellence and diversity of Italian wine around the globe. VIA this year launched the seventh edition of its Certification Course and today counts 151 Italian Wine Ambassadors and 11 Italian Wine Experts.